When importing contacts into your account, we have to be careful and only allow valid email addresses. This is because if invalid email addresses are added to your account, it will lower your email deliverability plus result in high bounce and spam complaints. 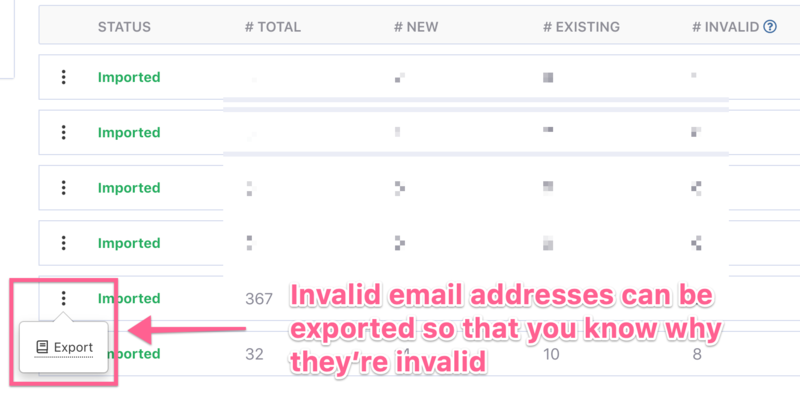 Under your Imports page, you can now know why an email is invalid. Simply export it to a csv file. As you may have noticed, we've totally revamped the Contacts Page. You now have much more control over the type of contacts you wish to see on the Contacts Page. You can drill down deep into the exact types of contacts you wish to search. 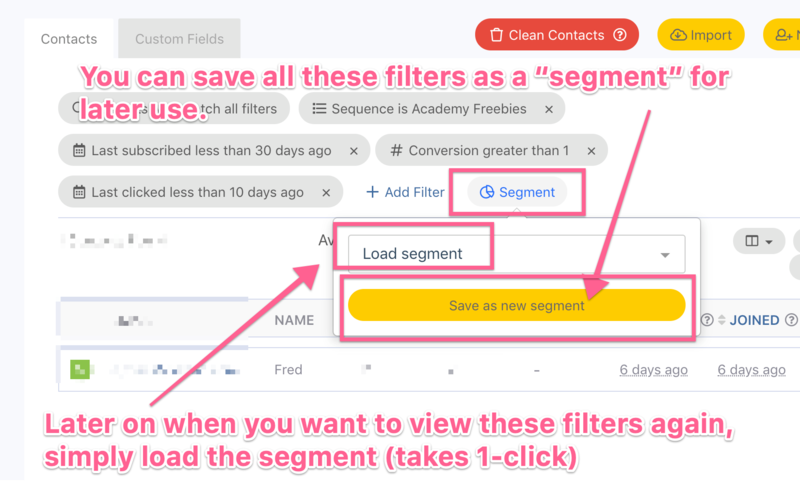 You can save all these filters as a "segment" for later use. Later on when you want to view these filters again, simply load the segment (takes 1-click). This gives you an overview picture of how engaged the contact is with you. Joined means when the contact was added to your account. We hope you enjoy the newly improved Contacts Page. Previously, for double opt-in... when a contact hasn't confirmed yet, inside the contact details, under Sequences it will say [Completed]. Now it will say [Unconfirmed]. You can now specify which fields in your form are required/mandatory to be filled by your contacts. Email address is of course required. For all other fields, you now have control of whether you want to make it required or optional. 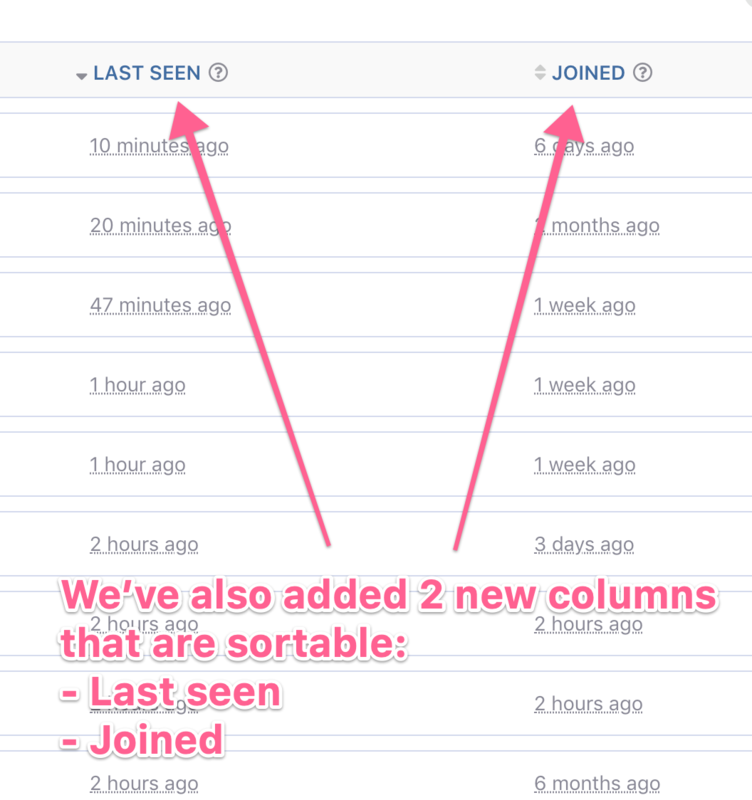 Previously the right sidebar sequence stats inside your individual sequence was showing the stats as raw numbers. 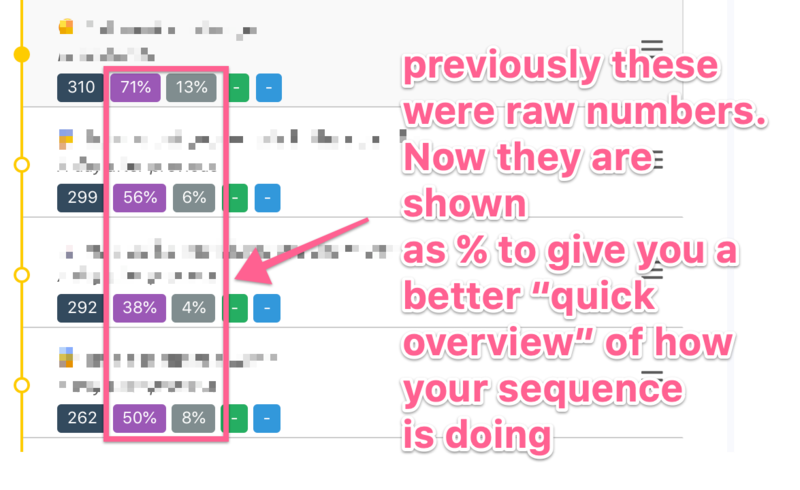 We've changed it to show % instead, to give you better "quick overview" of how the individual emails inside your sequence is performing. In the screenshot example, the open rate for Email #3 is considerably lower compared to the others, and I might want to check out why this is the case and tweak it to improve it. For Sequences & Broadcasts, we've added a handy new function for you guys. "Opened but haven't clicked" -- which means who are the people who have opened my email but haven't clicked. These people could be considered "moderately interested" in your offer (opening your email means they're slightly interested) but not quite ready to buy yet. You could tag this group with "moderately interested" and send them another email broadcast or subscribe them to another sequence where you try to follow up. Previously... inside our (TRIGGER -> ACTION) Rules system, you can only send an email message (ACTION) to the contact who is triggered under the TRIGGER part. Now, you can also send an email message to any email address, for example to alert your sales team to follow up. (Trigger) When contact clicks "High end coaching program" link --> (Action) Send an email message to sales team to follow up. We've just released our BirdSend Referral Program. We're looking forward to sending you commissions! Sometimes a subscriber forgets that he is already subscribed to you and he tries to subscribe again, in order to get your lead magnet (for example). With this new feature, you can now specify where you want to redirect them when this type of situation happens. You can choose to redirect him to the same page, or to a different page altogether. This gives you more control over where you want to redirect them based on the different scenarios. If using large display screen (for large monitors), some pages couldn't auto load more than 10 - 15 rows of data. Surely Birdsend will start publishing changelogs very soon.